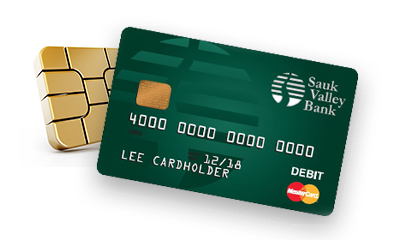 To provide an additional layer of protection, Sauk Valley Bank has invested in chip technology for all consumer and business debit cards. Not only does the chip provide more security, but it also allows for wider international acceptance. A microchip embedded in the card, adds a layer of protection against fraud for purchases made at a point-of-sale terminal (where chip enabled debit transactions are accepted). The chip generates a unique, one-time code each time you insert your card at a chip-enabled terminal. Your purchase can only be approved with the chip-generated code. We are ready to help! Simply call us at 866-632-4650 or visit any of our 4 convenient locations. Contact Us Today!